This is my second vector. It wasn't easy, because the screenshot is not in a good quality. Half of my vector was done without the help of the screenshot. But I managed to finish it! It took me about 16 hours. There are 80 to 90 layers. Patterns are from deviantART (can't remember their name), Photoshop and me. to be your second vector you did it awesome, it looks dramatic because of the way you used shadows and lights which it makes it different and interesting. I just watched episode 6 and I'm kind of surprised they added Hinako to Sana's list of possible love-interests. Nice wallpaper! Thank you for posting it! Such an interesting perspective... it's really interesting how you turned the 'cliche' kiss scene (usually in the sunset or snow) into an impressive wall ! 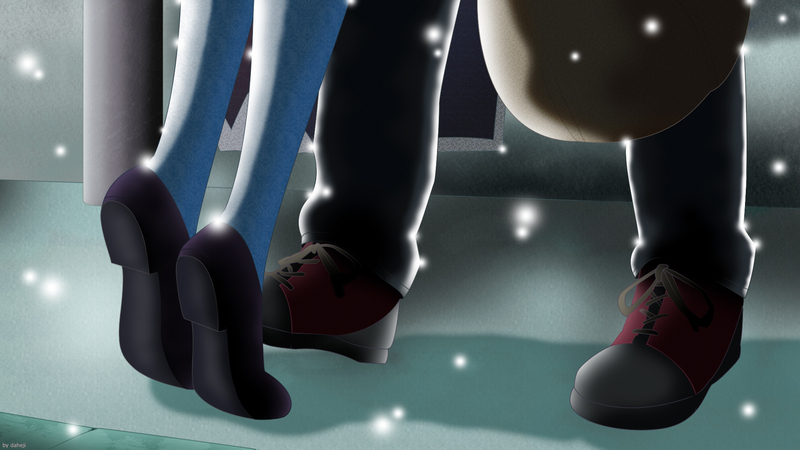 Good vectoring, and the textures are nice (i love those on the girl's socks), but maybe those on the 'cap' (or whatever that brown thing the guy is keeping is) are a bit weird (given it's flower patterned somehow ^_^').